Dr Sittimont Kanjanabootra and Francis Grennan from University of Newcastle, NSW, provide a summary of their analysis of research on the effectiveness of asbestos regulations in Australia, which has an impact for those in the hazardous waste removal, transportation and disposal sectors. 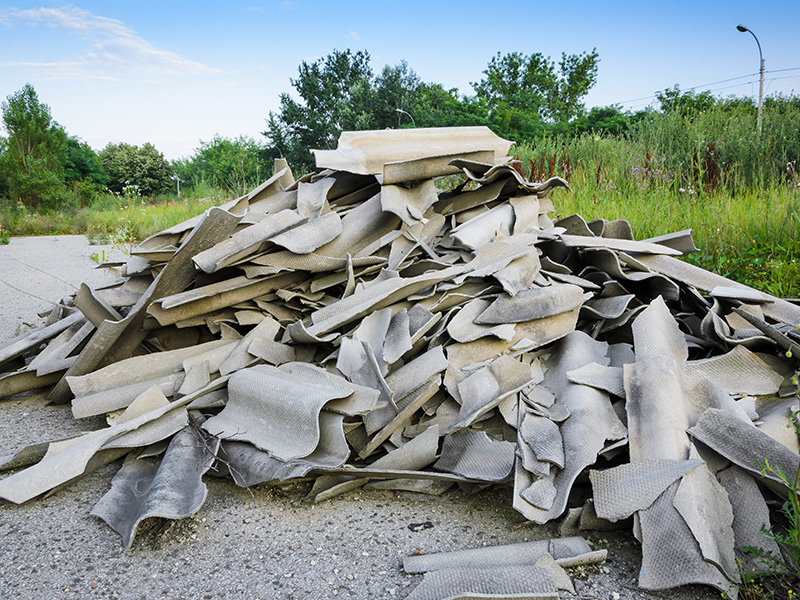 According to the NSW Ombudsman in 2010, one of the biggest consumers of asbestos in Australia from the 1920s was the construction industry, who used it as an additive to cement-based products in insulation, vinyl and asbestos containing materials (ACMs). These ACMs were used prolifically from 1920 to 1987, with consumption peaking in 1970, although the exact number of buildings containing them is unknown. In 2012, the Australian Government estimated that tens of thousands of buildings contained asbestos, with most still around today. The major outcome of this is having to manage it safely when demolishing or renovating buildings. It is now a significant waste management issue. All states and territories in Australia have structures to compensate workers injured by dust-related disease, including asbestosis. Combining data from all of them on asbestosis claims is difficult, as each follows different rules. Therefore the focus of this research was limited to NSW. To try and understand the effectiveness of regulatory change relating to asbestos use in Australian construction, we analysed data from the NSW Dust Diseases Board – which provides compensation to workers disabled by a work-related dust disease in NSW – together with data from several other studies published between 2010 and 2013.
of regulations, we referred to the NSW regulatory system, as these are consistent with the level of the state’s compensation claims. 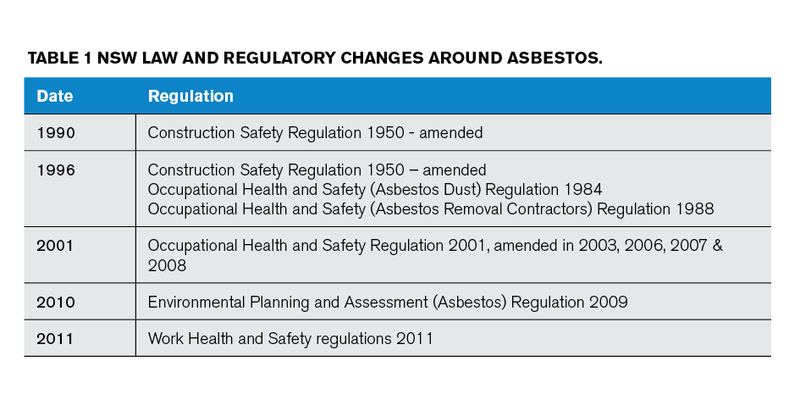 The regulatory regime relating to asbestos use in NSW is summarised in Table 1. 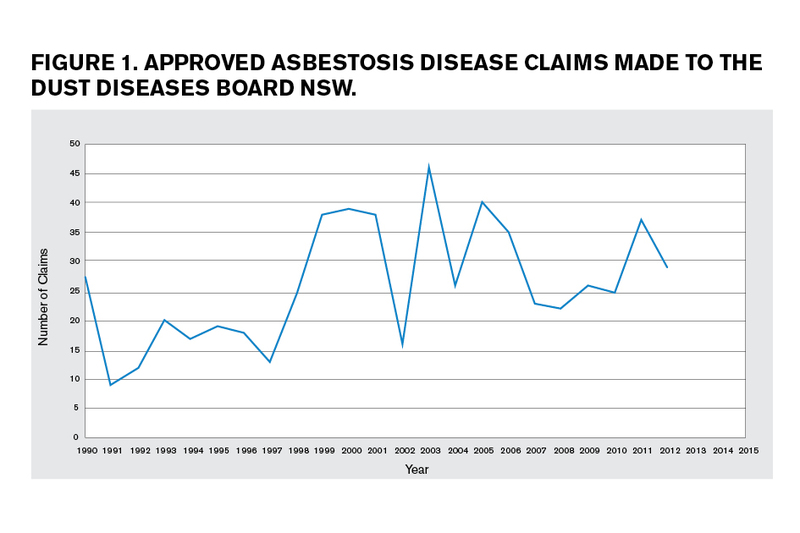 We reviewed the data collected from the NSW Dust Diseases Board to work out the number of new claims for asbestosis disease from 1990 to 2012, and adjusted them for a 15-year latency period to show the date of exposure for the workers who claimed in the period. We then compiled the data relating to asbestos regulations and coded it by the date when each was introduced. This allowed us to note any changes in exposure rates after new rules came in and compare exposure levels in 1990 and 2012, therefore assessing the overall trend in exposure between the regulated and unregulated periods. The information was then compared against the National Data Set for Compensation-based Statistics contained in the Safe Work Australia study, “Asbestos-related disease indicators 2012”, to reveal the consistency of NSW data against that from the rest of the country. in 2012 similar to 1990. The lowest was nine in 1991 and 46 in 2003.
but a decline overall. The numbers peaked at more than 300 in 2003, falling to 150 in 2010.
due to a belief among workers that they could identify asbestos in the workplace. They were complacent about removal procedures and clean-ups, with some workers adopting poor or no personal protection practices, and few workers were familiar with the regulations surrounding the removal and handling of asbestos. Similarly, Park and team’s 2013 study, which surveyed both DIY and non-DIY renovators, concluded that the majority did not know if their home contained asbestos and over 65 per cent had exposure incidents. Of the DIY group, 31.6 per cent had not used any form of personal protection equipment. 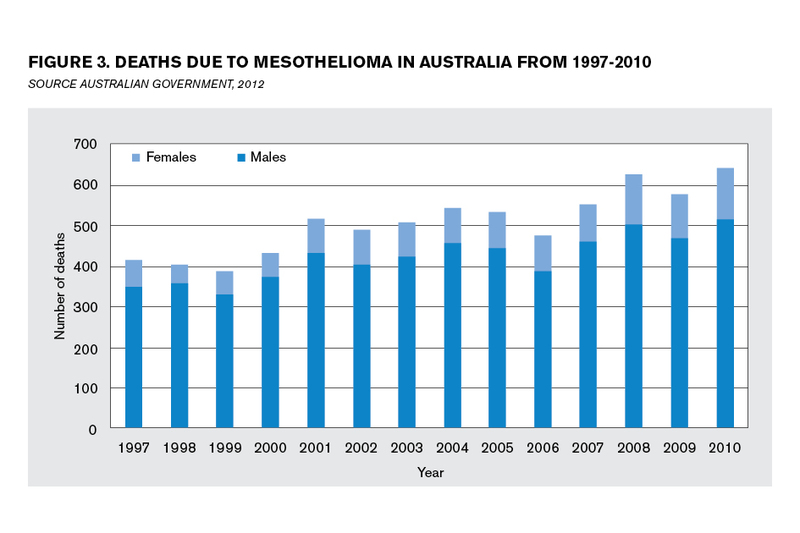 of a steady increase in deaths from mesothelioma (Figure 3). In summary, the research highlights the dangers associated with asbestos and supports the rationale for introducing regulations. 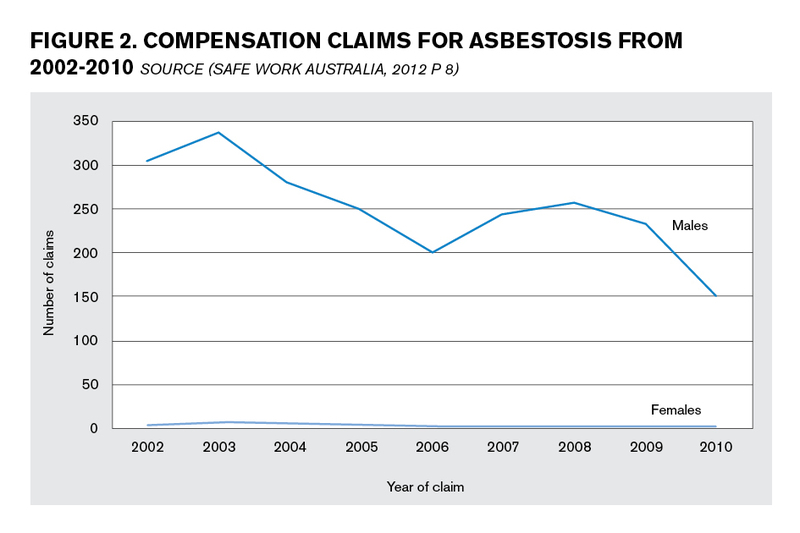 The results for the primary data on asbestosis compensation claims from NSW and the national data secondary source, indicates that there is a decline in asbestosis claims from 2003-2012 among employed workers. This corresponds with the introduction of regulations in 1987, 1990 and 1996. The NHEWS study conducted in 2008 also indicated a low level of asbestos exposure (0.3 per cent) among the 4,500 workers who took part in the study. Taking into account the three studies, it is reasonable to assume that the regulations are having a positive effect on exposure levels. This is significant for the waste management industry as the risk of exposure is still evident, albeit a declining risk. The research also indicates that while the current regulations have reduced the risk of exposure to some workers, poor management and implementation suggests that risks may remain high among the self-employed and homeowners, and that deaths from mesothelioma are still increasing, again a significant risk issue for the waste management industry. The inconsistencies across the data show that the effectiveness of regulations related to handling of asbestos contaminated construction materials is at best variable. There appears to be a renewed need for re-education and further access to training for all those whose professional work or DIY practices could expose them to asbestos in known or unknown circumstances. For details of the references used in this analysis of research, contact the Editor at annmarie.unwin@primecreative. com.au. To obtain more details on the study, contact Dr Sittimont Kanjanabootra direct by email at sittimont.kanjanabootra@newcastle.edu.au.